As parents, we know that in order to accomplish family goals, we need a plan. We plan meals, events, the daily schedule, and more. With the crazy pace of family life, including meeting the basic physical needs of our children, our spiritual intentionality can slide to the back burner. We really want to read and memorize God’s Word as a family. But ah, yes, we need a plan. The fresh start of a new year is a great time to intentionally choose to memorize Scripture as a family. Today I’m sharing 8 ways to start a scripture memory plan this year. These creative prompts will help you choose the plan most conducive to your family dynamic. 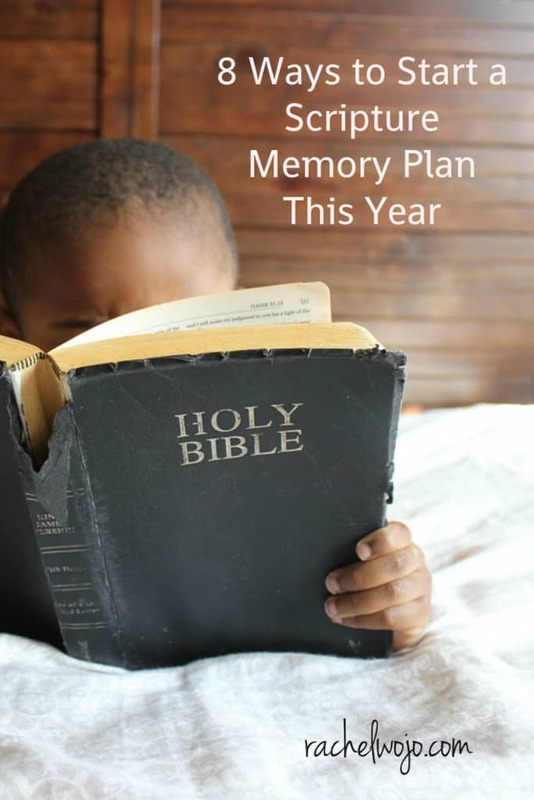 Though starting a plan at the first of the year boasts an enthusiasm all its own, this list of tips would be great to use any time of year to start a scripture memory plan. Ready? Choose one verse from your daily Bible reading plan and post it on the refrigerator for the week. Read it together aloud daily before dinner. At the end of the week, move the note from the fridge to a poster board stored in a visible place. At the end of the year, you’ll have two poster boards of 52 verses you’ve worked to memorize! Select 12 of your favorite Bible verses, perhaps allowing each family member to choose their personal favorite as part of the 12. Use a chalkboard or whiteboard and keep the verse visible in your kitchen or family room for a month. Say it together at breakfast each day for the entire month and by the end of the year, your family will not only know 12 Scriptures, but they’ll also remember that which verses are which family member’s favorite! Pick a Scripture passage of 26 verses with the goal of memorizing the passage in a year’s time. Using a notepad or journal, have each family member write out verse 1 of the passage one time a day for two weeks. The next two week period, add verse 2 to the passage, writing both verses each day. Continue Scripture journaling by copying the verses in this format for the year and your family will have a 26 verse passage memorized by the end of a year! Choose a short-term Scripture memory plan of memorizing one verse a week for a month. Maybe it could be based on a recent sermon you heard or Bible study you participated in. It could be from your child’s Sunday School or small group lesson. Set the goal of memorizing 4 verses this month at one per week and evaluate your progress at the end of the month before determining how to move forward. Use a group of topical Bible verses like this one on winning over worry to create a smartphone graphic album you can thumb through anytime. This style of digital memory verse cards provides the opportunity to read over your “cards” during wait times at the bus stop, train station, airport, school pickup line, in restaurants or doctor’s offices or any other waiting room. You can use this album as a family to test each other on the progress of the memorization and have fun in the process! Engage in Scripture Typer or one of these other 5 ways to help you memorize Scripture. Bible Minded is a new app I recently downloaded to help memorize Bible verses. I haven’t fully assessed this app just yet, but it might be the one for you. I’d love to hear what you think about it, especially if you’ve already used it! What if you had a resource for parents and children that provided a devotion AND a weekly verse to memorize? And what if that resource was written on your own level, one for parents and one for children, but coordinated beautifully for family discussion? Meet this fabulous pair of books, The Joshua Code and I Can Learn the Bible. The Joshua Code consists of 52 Scripture Verses every believer should know. Through studying one a week, you can implement one of the above ideas and memorize one verse a week this year. Your children can join in through using the Joshua Code for Kids, known as I Can Learn the Bible, 52 Scriptures Every Kid Should Know. Which Bible memory method do you think will work for you or your family this year? Special thanks to Tommy Nelson for sponsoring this post! This post of ways to implement Scripture memorisation has inspired me. It’s many years since I memorised verses and now seems a good time to do it again. l memorised verses from the KJV in my younger days, a version that is concise in its text, making verses easier to remember even if the language was a bit archaic! Thank you Rachel for giving me a prod!! I use the curriculum abcjesuslovesme for my son. Each week there is a memory verse for him to memorize. I also use the website, Memverse.com which has been perfect for me. I put in the verses, passages, chapters I want to memorize, including my son’s verses so that we can all be working on them as a family. The site has an excellent way of letting me work on memory verses as long as I want each day and increases the number of days between practicing so that eventually I am remembering it completely. I know it isn’t for everyone, but in this season I am focusing on it daily, so it has been perfect for me. As I now have more problems with memory as I am a senior citizen, I find this a positive action in helping me continue with my Bible study and Scripture knowledge. There is always so much more to learn, I look forward to undertaking this challenge in one of the manners that you suggested. I want to teach my 2-year-old grandson scripture as well. I’m looking forward to how much I will learn this new year! Thank you for the blessings we all receive from your ministry. May God continue to bless you and yours. I too am interested with learning more scripture,to memory. I have MS and have a very hard time with my memory but I am determined to try your challenge, I have used the repetition and writing it out for years with my Sunday School classes. I also out it on the fridge as a daily reminder. Just love your website. hoping your little son is doing well adapting to his new American home, I am a MOMS. Of two adopted children so Imknow,the joy it gives to complete the family. Thanks, Sally Ann! Toby is my adopted nephew. But we surely claim him as family! I usually have something in particular I’m working on or need so I search the Bible for verses on that topic and choose one. I am ashamed to say I have never tried to memorize bible verses. God continues to put specific verses I need to see in my path. I know it is because I need it, but I now realize it is for more than just that. I need to MEMORIZE it and make it part of me. Thank you for your encouragement! I have printed out the article. Also, as a senior, my memorizing days have been a problem. I’m new to the idea of memorizing Scripture verses, but I like to chose ones that remind me of how God wants me to live or ones that encourage and inspire me. I think certain verses that have a strong effect on one person may not have the same effect on another. We are spoken to through Scripture in very personal ways sometimes. It’s truly an amazing gift. I love this post, it helps me with different was to memorize passages that aren’t just about my life. I memorize passages according to the events in my life. I also use my feelings and things that interest me. You will never forget the memories of your life therefore, you will never forget the passages that guided you. Scripture memorization is so important and as I get older I regret all the years I could have been memorizing and didn’t. I want to encourage my grandchildren to start memorizing scripture as a part of their lives. You might want to try ScriptureBox.com, a web app that automates a rotational memory system. The best thing about it for us is that our verses and texts (catechisms, books of the Bible, etc.) for each day’s rotation are delivered to our Inbox each morning so we can review as a family at the breakfast table…no need to open a separate app just to review. Simple and effective.